One person’s hybrid is another’s mongrel. In binary choices like this, I tend toward the low-brow. The difference, I suppose, is intention: hybridization occurs in the laboratory with calculated purpose and enlightened curiosity for the success of the outcome. Mongrels like me just happen. That sentence was going to be longer, but, no, mongrels just happen. The random coupling of humankind produced me, as it did the majority of us who have ever lived. John Humphrey Noyes and more recent Mitteleuropäische experiments to the contrary, there have been mercifully few conscious efforts at selectively breeding our species—though I do wonder about entire suburban neighborhoods of upscale Texans intent on spawning a cheerleader or quarterback. (Efforts along those lines might be worthy of our attention with the genders switched. I can dream.) Science tells us that mongrels—random genetic assignations—are hardier, more resistant to disease, better positioned for survival, which makes me grateful to be one. Thanks, Roy and Marge. That being said, I must also confess to my own sort of social engineering in Agincourt. Many of its citizens are composites of people I know. Several of its buildings are hybrids from architectural history (or at least my understanding of it), such as the Christian Science church at Broad and Fennimore NW. At the end of the 19th and the early years of the 20th centuries, Christian Science sought an image, a corporate identity. Two architects of consequence stepped up to the plate—Bernard Maybeck and S.S. Beman—and designed buildings for Mary Baker Eddy’s reluctant denomination. Agincourt could have a Maybeck-inspired building (he designed only two churches that I know for CS) or one by Solon Spencer Beman, who designed dozens, including Fargo’s example, a hundred years old this year, if memory serves. But—here’s the “what if” fun of being an historian—suppose that the 1908 First Church of Christ, Scientist in Agincourt had been designed by both. I could imagine a scenario where a Maybeck design was “tamed” by Beman or a stolid Beman effort had been enlivened by the edgy, historically adventurous Maybeck. Is my effort hybrid or mongrel? So I wonder today about a less likely composite: author Frederick Rolfe, a.k.a. Baron Corvo, and architect Adolf Loos. I have been captivated by Rolfe since reading A.J.A. Symonds’s Quest for Corvo more than thirty years ago. My favorite of Corvo’s many published works (few of them published while he was living) is Hadrian the Seventh, a semi-autobiographical novel about a failed Catholic postulant who accidentally becomes pope and the Vatican was never the same. Given the topsy-turvy world of our new pontiff Francis the First, it may be time to re-read Hadrian. Hadrian decides that the papal apartments are excessive, wretchedly so, and opts for less opulent digs decorated by himself. Bricked-up windows are opened; walls clad with burlap and butcher paper; gilded furniture replaced with trestle tables and benches. Rolfe’s description conjures an image so clearly in my mind. Comparable reforms await the Vatican bureaucracy itself, until, of course, Hadrian VII is assassinated. Let us hope, if there is a god, that life does not imitate art. 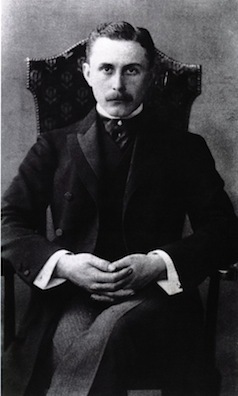 Adolf Loos, another of my hemi-demi-semi gods, wrote Ornament and Crime, an essay on the aesthetic complexity of his age, though his “reforms” tend toward Cipollino marble veneers, rather than butcher wrap. Even so, there is a kinship in the design notions of these two near contemporaries (1860–1913 versus 1870–1933). How might their lives have been conjoined in northwestern Iowa? Loos made a visit to North America during 1893–1896. His arrival, at least, is confirmed by immigration records. Loos is rumored to have visited the Worlds Columbian Exposition in Chicago and also St Louis (and elsewhere?) and to have worked as a waiter for two years or more, before returning to Austria and a remarkable architectural career. Agincourt had restaurants with aspiration; they needed waiters with suitable hauteur. Why not invite Herr Loos to Agincourt and give him sufficient time to renovate a cheap hotel room to his emerging design standard? Why not, indeed, and have him warming himself by the heat of a Franklin stove. He might even be reading, but it won’t be Hadrian the Seventh, which wasn’t published until 1904. 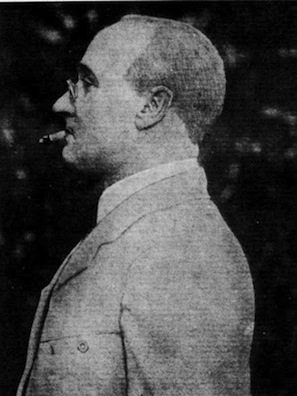 Not incidentally, Frederick William Serafino Austin Lewis Mary Rolfe died in Venice on 25 October 1913, St Crispin’s Day and the anniversary of the founding of Agincourt, Iowa. He is buried on San Michele, in the Venetian archipelago, a pilgrimage I have yet to make. 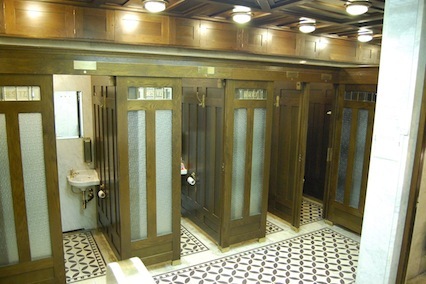 Loos toilets. Perhaps the most elegant toilet prior to Mies van der Rohe at the Seagram. Or should I have said “Loos’s loos”? These last few weeks, living in a foreign place, that notion of enjoying the moment, savouring, basking in it, perhaps even wallowing has been heavily on my mind. It occurred to me to add some “words to live by” to the Agincourt blog as a tool for understanding my own process. Today’s nominee is savour, largely because I’ve had so little time to actually engage substantially with the places I’ve been visiting. In British English—whose spelling I often prefer to American alternatives; grey versus gray is a case in point, just one of my many affectations—there is but a single letter separating savour and saviour. Happily (for me) the OED offers two very different roots, each from the Latin through Old French. The first derives from sapere (to taste); the second from salve (to save). ; though salvation is not currently on my radar. Among savour’s several meanings, these interest me especially: to relish or enjoy; to give oneself to the enjoyment of. They also suggest savor as a noun—the power to excite or interest—not a way I’d think to use it. Verbs are just so much more powerful than strings of adjectives. My gut reaction is that savoring is a generational thing, but that’s just too easy. Generational differences are simply too convenient an explanation for why I craved more time on Friday afternoon to absorb Pere Lachaise Cemetery on the lumpy eastern edge of Paris. The site of Pere Lachaise was acquired by Napoleon about 1803 as expansion for the shrinking capacity of Paris churchyards and crypts. But it didn’t flourish until a generation later when Napoleon III charged his planner Baron Georges-Eugène Haussmann with clearing out those crypts and burial grounds. So many human remains were removed that a special rail line connected the city with this remote postage stamp of property that has been enlarged seven or eight times. A map and list of notable interments—Champollion, Proust, Collette, Oscar Wilde, et al.—was a pop quiz in 19th and 20th century history. I stood and savoured only that for nearly half an hour. During and after the fact, I pondered my fascination with the place. Is it a question of (1) age-and-stage? 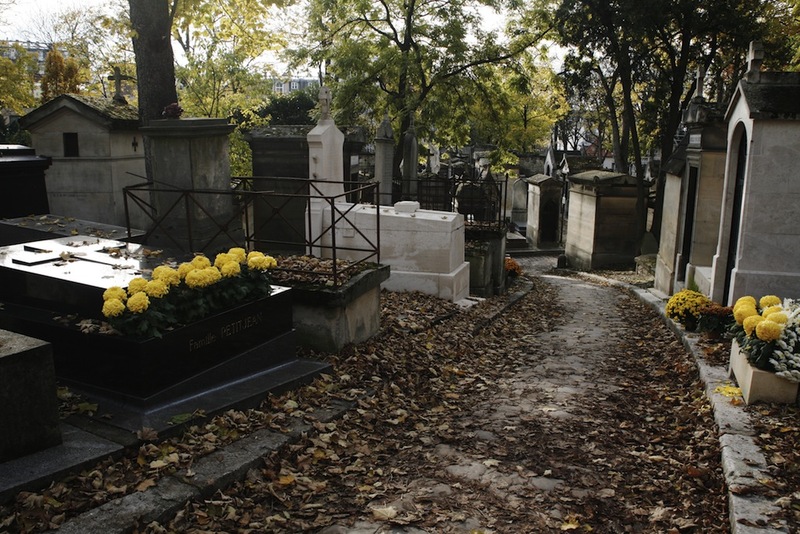 Were Friday’s parks—I do think of Pere Lachaise as a de facto historical park—interesting because I might soon be one of its residents? Or (2) are they important because of when I was born and the circumstances—the Cold War, the Bomb—that shaped my generation? Or (3) are they more particular to my personal evolution; to the events that brought Agincourt into existence, for example? I won’t stop wondering. The palpable melancholy of Pere Lachaise does have direct application to Agincourt. I hoped that my time there would help with the design of The Shades, Agincourt’s non-denominational cemetery. It will not be as dense or picturesque as Pere, but the inscription on ancient Greek above the entrance—”We are dead. Save your tears for the living.”—is intended to generate similar feelings for the sublime and nostalgic. Like anything we design, it takes time; architects, after all, are ruminants and must chew their cud again and again. It requires savouring, one of my new words to live by.